Beautiful weather for the 49km of the Pilipinas Akyathlon resulted in highly motivated runners at the start. Several of them were newbies or roadies coming to trail for the first time, and they certainly left their marks. In the men’s race, Helmer Retolado stepped onto the international scene by winning in a strong fashion ahead of Larry Apolinaro, who had been leading earlier on until Retolado caught him in the last 5 km. Both of them made their debut in the ATM circuit. Retolado hails from the Rizal mountains east of Manila, while Apolinario comes from one of the southern islands. The winning time was 6:24. The podium was completed by Baguio home runner Jeff Aligan, who was second in this race behind Elias Tabac last year . Edu Losnong and Al Telias were the next home runners in the finish. In 14th place we had American Chris Miller. Coming from Virginia, Miller scored 10th in the Tahura Trail three weeks ago and is the only runner who did that double. Miller’s 14th spot was just good enough to overtake Kazufumi Ose on points and become the new leader in the ATM Championship after three races. He will stay on top for at least a month as the next points race is on 10 March, the Cordillera Mountain Ultra. Also in the women’s we have a new championship leader, after some revisions were made to the result of the 9 Dragons in Hong Kong last week. Canada’s Carrie-Jane Stander is now ranked as a finisher and was 9th on the 50 miles. Combined with her 5th place in the Akyathlon last Sunday, the always smiling Stander hops ahead of Magdalena Boulot to the top of the women’s championship ranking. Last season, Stander won the 70k race at Ijen Trail in Indonesia, and ended as 11th in the championship. During Akyathlon, the pace set by local women Jenny-Vi Fontanella and Cheryl Navarro proved to be a bit high, though. Fontanella is a cyclist who has only recently began trail running. Her battle with established runner Navarro was high-level as illustrated by their 8th and 11th place in the overall result. Fontanella even stayed under 8 hours. In third place was Cecille Wael, who continues to make progress in her performance. Considering her idol Majo Liao - last year’s winner - was 40 minutes behind and Stander more than 90 minutes, Wael ran an impressive Akyathlon. The Pilipinas Akyathlon this Sunday is the first of two points races back-to-back in the Cordillera mountains around Baguio. It is the race where Davao’s Elias Tabac appeared on the international stage for the first time, winning the 46 km in commanding style ahead of local stars Aligan and Sano Oy. This weekend the longest distance race has been beefed up to 49 km and 3500 m of elevation gain, and we are looking forward to seeing more new faces emerge in competition with already established top runners, such as Majo Liao and the Telias brothers. Larry Apolinario is one of those runners coming from the southern islands of the Philippines, who is keen to show himself to the world. Also Joseph Noy Gentoleo is one to watch. He scored two top five placings in ATM points races last season, and also won the Mount Talinis Mountain Marathon. Of the two Telias brothers, Al is usually the one who stands out on the 50k distance, while James is seen more often on the ultra distances. Al Telias is always a reference for races in this mountain area, but landing the big victory so far has eluded him. Will tomorrow be his day? Another local hero, Marcelino Sano-Oy, was chasing Elias Tabac and Jeffrey Saligan all the way to the finish last year and is therefore a logical top favourite as well. Sano-Oy is a former winner of Cordillera Mountain Ultra, too, the event that takes place in the same area here next month. Pilipinas Akyathlon is the local championship of Skyrunning and also the third points race of the 2019 ATM season. On the start list we see a few athletes who already have Tahura Trail or the 9 Dragons in their legs. We will be paying attention especially to American Chris Miller, who ran himself in the top 10 in Bandung three weeks ago. Miller collected 310 points and this weekend needs 240 to topple last week’s 9 Dragons winner Kazufumi Ose from the top spot in the championship ranking. 240 points corresponds to a top 17 finish in Akyathlon. It’s early days in the championship of course, but if you’re active now you can find your name in the top places of the ranking for quite some time and you can choose your races tactically later on in the season. Also on the start list is Ijen 100 winner Sungsik Joh from South Korea. Sungsik may find Akyathlon a little short for his characteristics as a trail runner, but a good placing is always on the cards. Tomorrow’s women’s race will see last year’s winner Majo Liao return to the scene. Majo Liao is one Philippines’ most established trail runners and purely on experience alone she will certainly feature again this weekend. Expected rivals for the victory are Cheryl Navarro, Cecile Waes and Carrie-Jane Stander. The latter, and her husband Kent, had a tough time in last weekend’s 9 Dragons Ultra and will be motivated to score a good result. Carrie-Jane Stander is the winner of Ijen 70 last season, so she already knows how to win on the ATM tour. As always, ATM will be reporting live from Tinongdan and the Akyathlon tomorrow from start to finish. After several top placings in ATM races, tomorrow finally the big win for Al Telias? 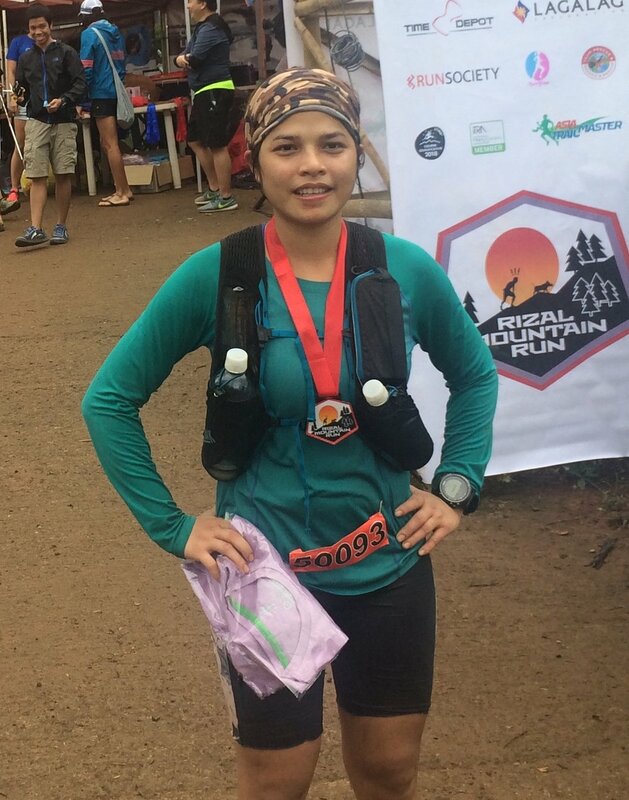 Just one week after John Ray Onifa confirmed his status as up-and-coming Filippino trail star at Rizal Mountain Run, two more pinoys with a road running pedigree defeated the established trail guard at the excellent Pilipinas Akyathlon event in Baguio last weekend. Elias Tabac from Davao on Mindanao Island in the south of the Philippines won the 46 km and 3250 hm mountain race in a stunning time of 5 hours and 42 minutes, trailing local runner Jeffery Alligan for 43 km before launching an impressive dash to the line. Tabac’s attack was so explosive the gap to Alligan had grown to 7 minutes at the finish. Cordillera trail star Marcelino Sano Oy had just about caught up with the front duo in the final 4k, but the end verdict was ten minutes behind the winner! Before the start of the race at 4:30 a.m., Mount Apo Sky Race organiser Doi Calbes said to us: “keep an eye on Elias”. Elias Tabac turned out to be a young 2:44 marathon runner, who was doing his third trail race but his very first at Asian high level. Untested in other words, and surely the Akyathlon with the long climb up Mt Ugo and the 3250 meters of elevation gain in just 46 km cannot be compared to any road marathon. Yet is seems to be the new trend in the young 2018 season that road runners are taking the trails by storm and giving the established trail runners a lesson in speed. Second-placed Jeffrey Alligan reportedly only ran his second ever trail race, and his first was way back in 2015. The two were leading a well-stacked field from early on. Al Telias, likewise in excellent shape these days, gave it all he got and was seemingly disappointed with his fifth place at the end, close behind Wilnar Iglesia. A further look at the top 10 proves just how good this competition was. Lipa six, Carranza seven, regular podium placer Aldean Lim eight, Dean Perez - 3rd in Rizal - ninth and last year’s Cordillera Mountain Ultra winner and #5 in Vietnam Mountain Marathon, Arnold Lozano, had to be content with tenth! Lozano admitted he had probably been a bit nonchalant at the start by lining up towards the back of the pack. Yet nobody seemed to have expected Tapac and Alligan to step on the throttle like they did from the get-go. Both athletes love running on trails, but they will continue to combine trail with road races. It goes without saying that both could become a contender for the Asia Trail Master championship with this level of speed. Speaking of which, Vancouver-based Dean Perez is the new points leader in the men’s championship standings. He’s the best of the runners who have already finished and scored points on two of the three ATM points races in the beginning of this 2018 season. Dean Perez is Filippino, very experienced trail runner in North America, and expressed his admiration and surprise of the competitive races in his native country. Still on holiday till March, Perez has also signed up for the Cordillera Mountain Ultra on 4 March, so we may find his name on the leaderboard still for quite a while. If there was any betting on the women’s podium of Pilipinas Akyathlon, either someone brave got very rich or nobody won anything. Sandi Menchi, Gretchen Felipe and Rizal winner Aggy Smith Sabanal were all at the starting line… but not at the finish. What happened? Sabanal already said she was feeling unwell before the race began and quit in the early stages. Sandi Menchi and Gretchen Felipe were leading until they both took a wrong trail and continued to follow that one for what eventually turned out to be nearly 5 km. Their mistake proved very costly and eliminated all chances of a podium finish, as they had to run those 5 km back… mainly steep uphill even. Also the women’s field had competitive runners including Majo Liao, who anyway was expected to put some pressure on Sandi Menchi. Majo Liao took the lead and held onto it with a well-paced and consistent effort in what was her first trail in nearly half a year. For the 28-year-old Manila-based Liao it was the third career ATM race victory. Behind her, Baguio girls Marjorie Sofla and Marjorie Velo had a nice tight batlle for the second and third place steps of the female podium. Pilipinas Akyathlon was a new entry in the ATM championship and a successful one. 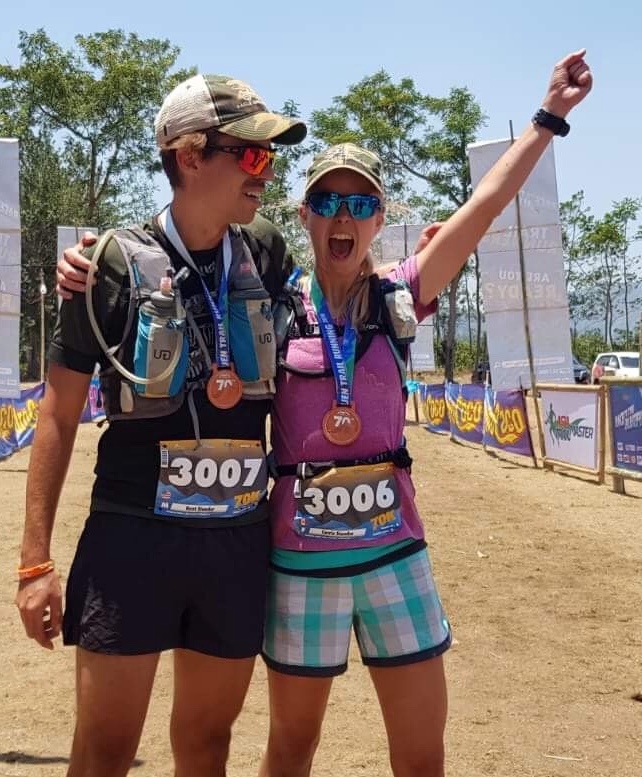 Taking place on the other side of Mt Ugo compared to Cordillera Mountain Ultra, runners will not be disappointed by choosing to run both races. Video footage of the finish including interviews is available to watch on facebook. The next points race is the first SuperTrail of the season: Ultra-Trail Koh Chang in Thailand. Finishers of the 100k and 70k races will score 50 additional bonus points for the championship.